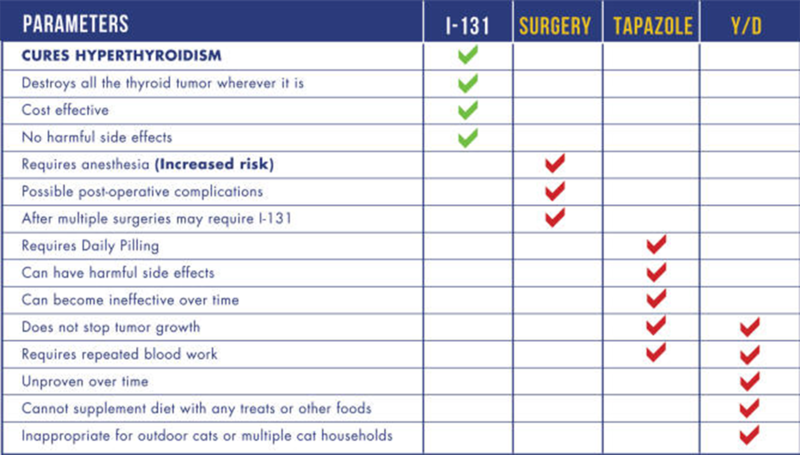 IODINE-131 TREATMENT FOR FELINE HYPERTHYROIDISM — A ONE SHOT DEAL! It’s the only method that consistently eliminates thyroid tumors — for good. It’s more cost-effective than drugs or surgery. There are no harmful side effects. There is no tissue or organ damage – including the parathyroid glands. There is no damage to healthy thyroid tissue. There is no anesthesia required. There is no daily pilling. It destroys thyroid tumors wherever they are located. It returns thyroid function to normal usually within one month. provider in the world. Here's why. Does not cure the disease or kill the thyroid tumors; in fact, the tumor can keep growing, making medical management less and less effective. Causes harmful side effects like nausea, vomiting, lethargy, lack of appetite and hair loss/facial scabbing. Causes loss of vital white blood cells and blood clotting abilities. Causes long-term damage to liver and kidneys. 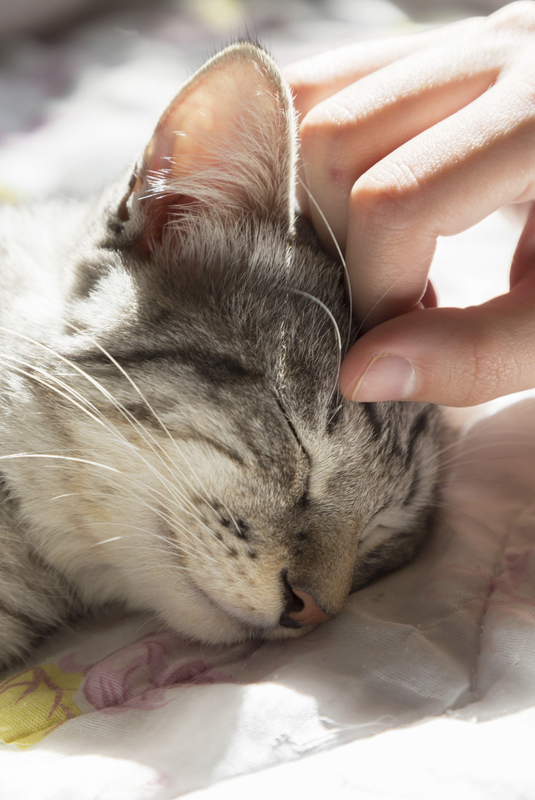 Damages owner-pet relationship by requiring pilling, 1-3 times daily. Increases the need for blood tests to monitor thyroid hormone levels and potential side effects. Costs $250-$700 per year, for the rest of your cat’s life. Creates difficulty in identifying/removing the entire tumor. Leads to persistence of Hyperthyroidism post-surgery (80% of cases already have another tumor on the opposite side that will become clinically significant within 1.5 years). Costs $1500-$2000 for one surgery. Is often performed in two surgeries. Leaves thyroid tissue in the chest where the tumor can recur. Leaves many cats still needing I-131 therapy, even after undergoing one or more surgeries. As you can see, Radioiodine therapy is the clear treatment of choice and the only consistent cure for Feline Hyperthyroidism.